Enables carriers to test for efficient and reliable handling of voice, data and video traffic over SONET/SDH networks. ACTERNA has released the ONT-506, a portable multi-port, multi-technology and multi-channel solution that enables carriers to test for efficient and reliable handling of voice, data and video traffic over SONET/SDH networks. The ONT-506 enables testing under realistic load conditions from the desktop or in the field via one compact chassis. SONET/SDH devices are highly-integrated platforms that provide very high port density and port counts as well as the ability to support multiple SONET/SDH rings. These devices are much more complex than legacy SONET/SDH equipment and create new challenges for the design of appropriate test procedures. They also integrate new technologies like LAN interfaces and services like Ethernet private leased lines. The ONT-506 helps address these challenges by bringing increased flexibility and versatility to the Acterna ONT family of optical network testers, which includes the portable four-port ONT-50 and the 12-port rack-mountable ONT-512. The system allows design, verification, integration and production test engineers of multi-service provisioning platforms (MSPPs), cross connects, ADMs and Next Generation (NextGen) network elements to measure the performance of thousands of channels simultaneously. This minimises the performance risk associated with relying on a single test channel. 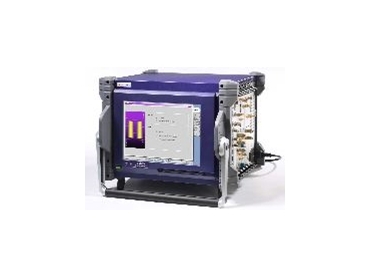 The ONT-506 supports a wide variety of test applications and technologies, including SONET/SDH, G.709 FEC, VCAT/LCAS/GFP, Ethernet, PoS, jitter, wander and OSA. For users of the multi-channel option, it enables testing and verification of SONET/SDH devices by measuring the performance of thousands of channels simultaneously, minimising the performance risk associated with relying on a single test channel. The ONT-506 has a 15-inch colour touch screen display and multi-user capability. It addresses the challenges of testing SONET/SDH grooming and switching performance, and its multiple ports allow users to load/analyse line interfaces simultaneously. Its multi-port operation allows for local and remote control and its six slots provide for easy upgrades and reconfiguration in the field or the lab. It also addresses the research and development requirements of both network manufacturers and operators with its multiple channel and port-test application. During the module design phase, it is important that the specifications of each design release are met. This phase requires instruments that support various interfaces, technologies and conformance-testing capabilities. For the system integration testing phase, the manufacturer must thoroughly test the operation of hardware and software under different load and stress conditions and identify problems. With its multiple channel/multi port capability, the ONT-506 is suitable for the test requirements of this phase. During the test-floor phase, the manufacturer determines the system’s compliance to external specifications, including those of international standardisation bodies like ANSI or ITU-T. The latter test requirements are similar to those of the system integration phase, making the ONT-506 an ideal fit. The ONT-506 is also well suited for interoperability and production testing. With its six slots the ONT-506 can use any combination of modules for the ONT product platform, including those that test SONET/SDH (2.5G/10G), Ethernet over SONET/SDH, Ethernet, OTN, and jitter/wander (10G/10.7G).